Email messages that include a social media sharing option generate a 30% higher click-through rate (CTR) than those without sharing options—and messages with three or more sharing options generate a 55% higher CTR, according to a study by GetResponse. 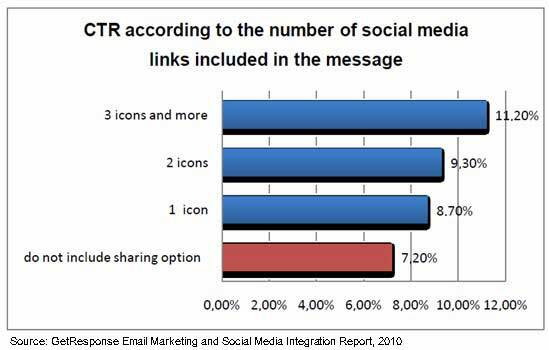 Among email messages studied (those sent via the GetResponse email marketing platform), emails with one sharing icon returned on average an 8.7% CTR, while messages with 3+ social sharing icons generated 11.2%. Below, other findings from Email Marketing and Social Media Integration Report, which studied 500 million emails sent by small and medium-sized business (SMB) and small office and home office (SOHO) businesses via the GetResponse email marketing platform.